Prioritize support for Community Sharing innovators who promote reuse, borrowing, swapping, repair and maintenance of goods, combined with educational efforts to promote buying less and smarter. 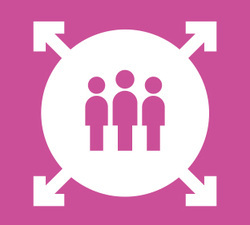 Enable Community Sharing by supporting a sharing inventory and web page, promoting events and ideas, and acting as a facilitator and connector. Consider incubating and/or coordinating Fix-It Clinics. To scale Community Sharing, shift to community-based behaviour change, support expansion into new neighborhoods, help innovators get better organized, and provide underutilized public spaces and municipal infrastructure. Consider adopting a more systematic, on-line approach to sharing spaces for Community Sharing innovators modeled on the UK Space for Growth programme. Missing out on the opportunity Community Sharing presents to foster healthy, connected communities while promoting other goals such as more affordable living, reducing eco-footprints, and supporting business and workforce development. Getting too fixated on understanding the impacts on city priorities upfront; instead tie them into pilot project efforts and/or engage innovators to help measure impacts.